New 4 channel Apache electric RC helicopter now in stock and on sale. We purchased a large amount of these RC helicopters and are now passing the savings onto you! The long awaited Apache model electric remote control helicopter has landed! This RC heli is 4 channels and comes completely assembled and ready to fly right out of the box with the transmitter. Measures about 15" long and all you need to do is charge the included and upgraded lithium battery with the included charger and you are ready to fly. Fly up, down, left, right, bank left, bank right, forward, and backwards with precise control. It also uses a blade flight design system made from highly durable impact plastic. Flying this rc helicopter is a pleasure for the beginner as well as the advanced rc helicopter pilot. Order today and we are offering an upgraded li-poly battery (15-20 minute flight time) and charger with each Apache helicopter. Plus, we will throw in and an extra set of main blades for free! Complete Kit, READY TO FLY. Overall I'm pleased with the helicopter. The instructions say to fly it indoors but since it's RC and not iR it is safe to fly outside if it's a calm day with no wind. 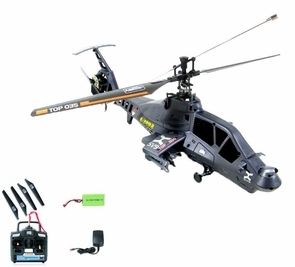 Apache Military Full Function 3 Channel RC Helicopter is a ready to fly heli that has great flight functionality.